Even during the last decade’s decline of the desktop, architects, designers, and engineers alike have been the stronghold target buyers for producers of powerful desktop computers. Apple’s iMac - once the titan of desktops - has seemingly lost its touch with that crowd, who have become disillusioned with the brand’s recent lack of innovation for the needs of its original fanbase. Microsoft has taken advantage of this opportunity to swoop in and save creative professionals in the most stunning, high-definition, luxurious way possible. 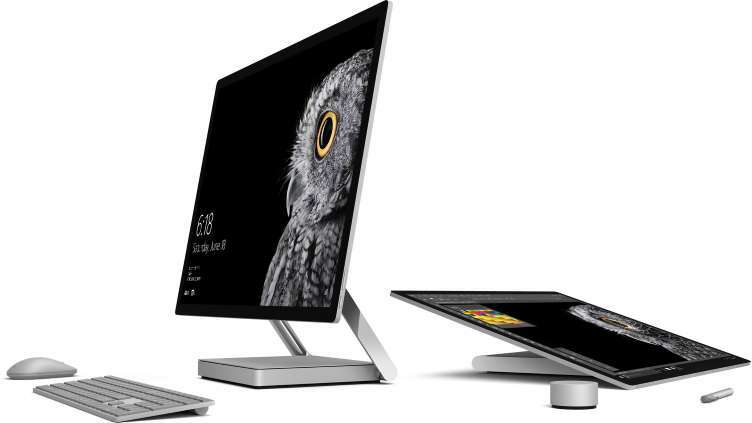 Since its release in December 2016, the Microsoft Surface Studio has become the go-to choice for those looking to design and create perfection. The Surface Studio is on sale at three different price points, but even the base model is anything but basic. The Studio’s design has thrilled architecture bloggers, artists, and illustrators, making it 2017’s biggest news for all-in-one desktop computers. Microsoft built the Surface Studio by combining some of their classic hardware and software with some surprising and attractive new tech. The PC relies on the familiar power of 6th Gen Intel Core i5 and i7 processors and Windows 10 Pro. The desktop itself looks like a bulkier version of the iMac, increasing the screen size to a huge 28 inches and adding a screen so high-def you can read from it across the room. 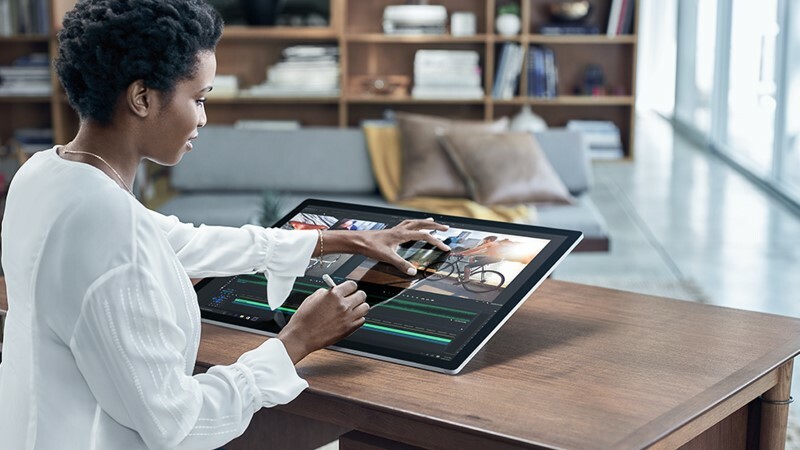 The computer itself is notable for three main qualities: a powerful, beautiful, convertible screen, a strong set of software specs, and its integration with the Surface Pen and Surface Dial for endless artistic possibilities. Microsoft cuts no corners on the all-in-one, which features the Nvidia GeForce GTX 980M graphics card and a 2TB hybrid drive. The Microsoft Surface Studio’s appeal to artists and designers is clear. With 10-bit color depth and 13.5 million pixels, the all-in-one is the clear leader in visual quality. 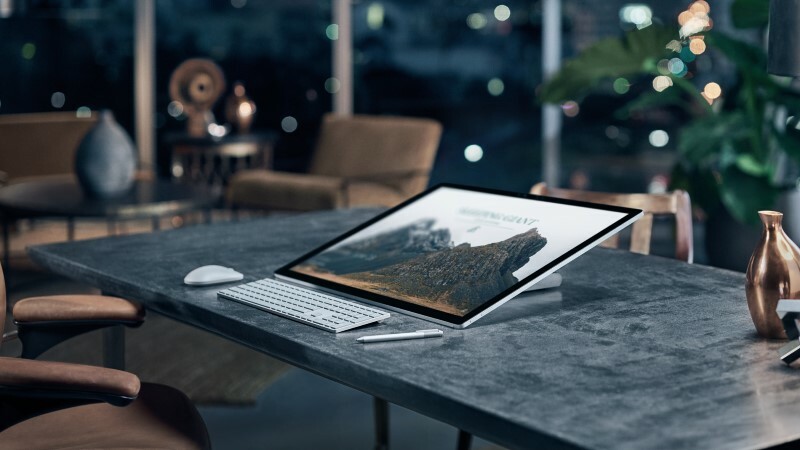 No matter which configuration of the Surface Studio you choose, your creative process and products are sure to get the attention, precision, and color they deserve. 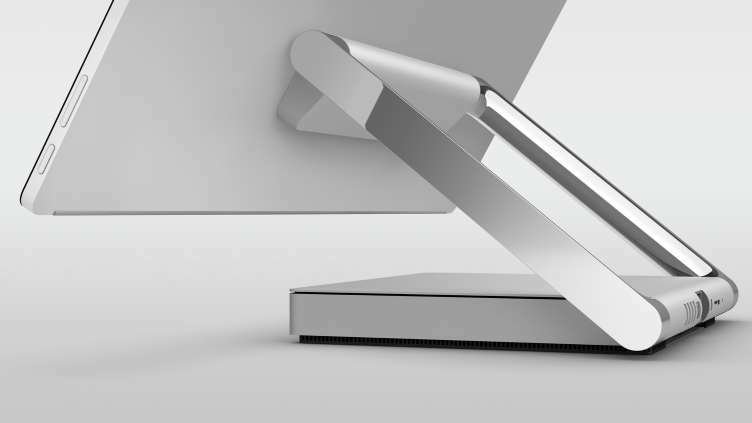 The 12.5 millimeter thick screen is obviously the gem of the Surface Studio, with a groundbreaking 3:2 ratio for optimal presentation of any creation. The PC is the first to utilize a Zero Gravity hinge, which means that you can adjust the screen to any angle with only one finger. It also means that the Surface Studio can become a sturdy drafting table at any angle, with a hinge that has amazed even the most skeptical users. The one catch? The Surface Studio won’t fold below 20 degrees, as Microsoft cares for its creative users and the dangers of their possible coffee spills. Why spend almost double what you would for an iMac? Is it worth it? It’s worth it because it will give your art digital clarity like you’ve never seen before. The brushed aluminum finish and slim profile will make your desk look chic like you’ve never seen before. It will even make Windows look good in a way you’ve never seen before (Maybe even good enough to make the switch). This all-in-one was designed for creatives of all kinds, whether you plan to draft building blueprints on the 4,500 x 3,000 (192 DPI) resolution screen or draw your latest illustrations and graphics with a Surface Pen that offers just the right amount of resistance for that paper-and-pen feel. 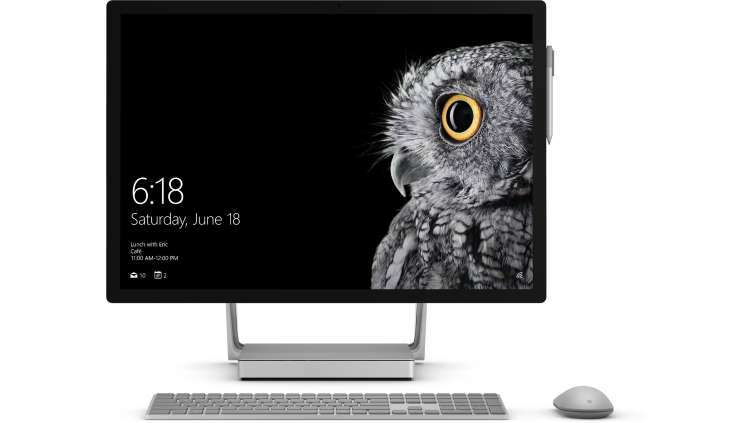 Microsoft even makes set-up a breeze for the busy professional: the Surface Studio’s companion mouse, pen, and keyboard are all wireless, and all automatically connect to the desktop PC straight out of the box, with no pairing required. In addition to the Microsoft Surface Studio’s already impressive specs, the Surface Dial is a $99 optional add-on that brings much more than drawing to the digital canvas. 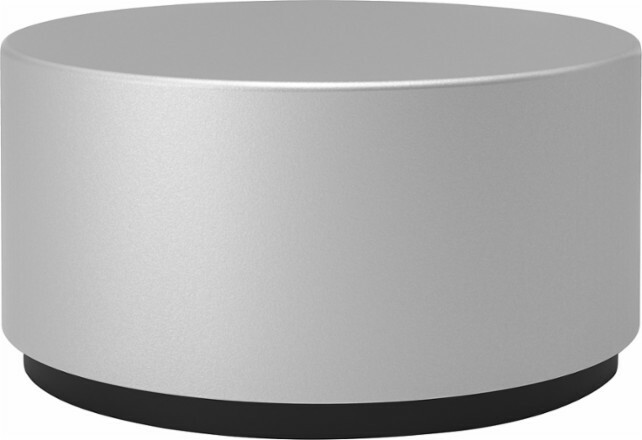 The Surface Dial works on and with your Surface Studio, giving you easy access to drawing tools, shortcuts, and various controls. Create the creative space you want with another one of the Surface Dial’s sweet specs: full command of your songs on Spotify, Groove, and Pandora. The Surface Studio is one of Microsoft’s first endeavors into the exclusive world of luxury PCs, and it has made an astounding first impression. If you won’t take our word for it, check out some of these stellar reviews for the desktop that does it all. For designers, creators, artists, architects, engineers, and anyone in the market for the best digital drawing board on the market, the Microsoft Surface Studio is worth the investment. For those in the U.S., the Microsoft Surface Studio has been available since last December. But for professional creatives around the world, the Surface Studio is still just out of reach. Big Apple Buddy has set out to erase this barrier, helping customers in over 110 countries get their hands on the most sought-after all-in-one PC on the market. Get in touch with us today to see how you can order the Microsoft Surface Studio!